It has now become abundantly clear that President Donald Trump of the United States of America no longer wishes to engage his administration with the Paris Climate Agreement. Consequently, the USA, one of the greatest contributor of greenhouse gases, global warming and climate change is now under no binding or non-binding agreement for ensuring the protection of the global climate. However, if President Trump won’t lead, Planet Earth has an ally in the former governance system of USA. The burden of leadership for protecting the environment, and for helping Americans protect the climate has now fallen on the US Ex-Vice President Al Gore. After putting together An Inconvenient Truth documentary, which highlighted the issue of climate change among the masses, and after releasing another film, An Inconvenient Sequel: Truth to Power, Al Gore continues to lead the American people for reducing the carbon footprint of the USA. Al Gore now calls for citizens from around the world to receive The Climate Reality Leadership Corps training, which will be the 36th such training and will take place in Pittsburgh, Pennsylvania, USA, from October 17-19 2017, with support from the Heinz Endowments. Interested individuals can apply for the training at the earliest by clicking here. 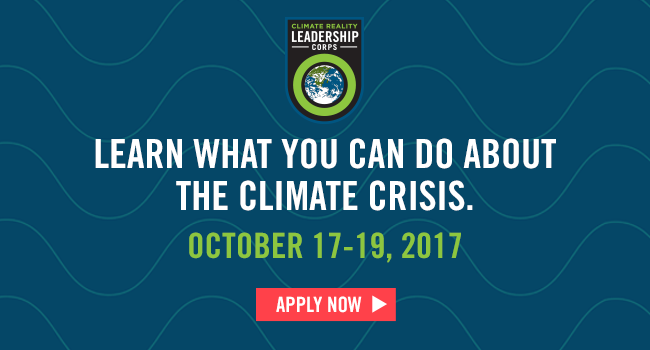 Climate Reality Leadership Corps Training are completely self-funded by attendees. There is no fee to attend the training, but you will need to pay for your own travel and lodging. During the training, The Climate Reality Project will provide all training materials. Completing the training means you will be a member of the Climate Reality Leadership Corps and join the global network of Climate Reality Leaders. Climate Reality Leaders commit to a minimum of 10 activities with The Climate Reality Project – including presentations, media outreach, advocacy, and holding or attending events – within a year after attending a training and will be required to sign an agreement to this commitment prior to the training. If accepted, you must attend all three (3) days of the training.